Before I visited Nepal, I was aware of exactly two dishes on a Nepalese menu: dal bhat and momos, and I had no real appreciation of either one. I expected stunning mountain vistas in the Himalayas but did not anticipate the diversity of flavors of Nepalese cuisine. 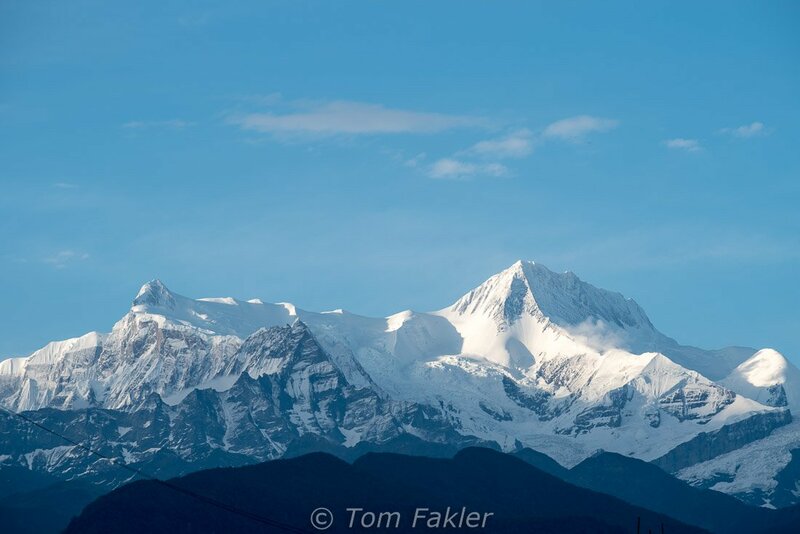 What I learned—and tasted—during the month that Tom and I spent together in Kathmandu and Pokhara vastly deepened my experience of the country. There are many ethnic groups in Nepal, each with their own culinary traditions. And then there are the not insignificant influences of neighboring China and India. Dal-bhat-tarkari, Nepal’s national dish, takes its cues for flavor and presentation from India, but with subtle differences. 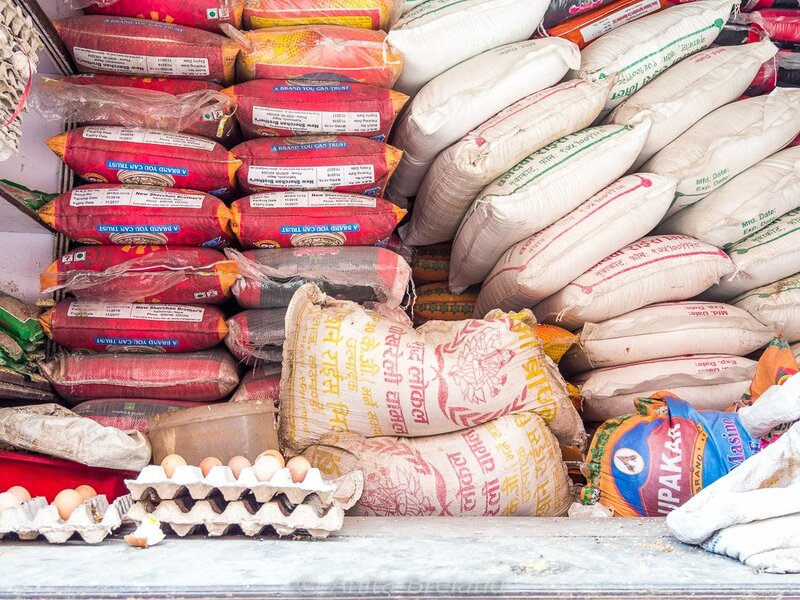 Foods prepared by the Sherpa community around Mount Everest bear more than a passing resemblance to Tibetan cuisine and rely on a limited range of ingredients available in the mountains. Dishes influenced by China’s Yunnan and Sichuan provinces are readily available on restaurant menus. The festive dishes of the Kathmandu Valley’s indigenous Newars have gone mainstream and offer an adventurous dining experience to curious travelers. My experience of ayurvedic foods on a yoga retreat in Pokhara, Nepal’s second city, rounded out a flavorful introduction to Nepalese cuisine. Read on for a sample of the foods that tickled our taste buds! 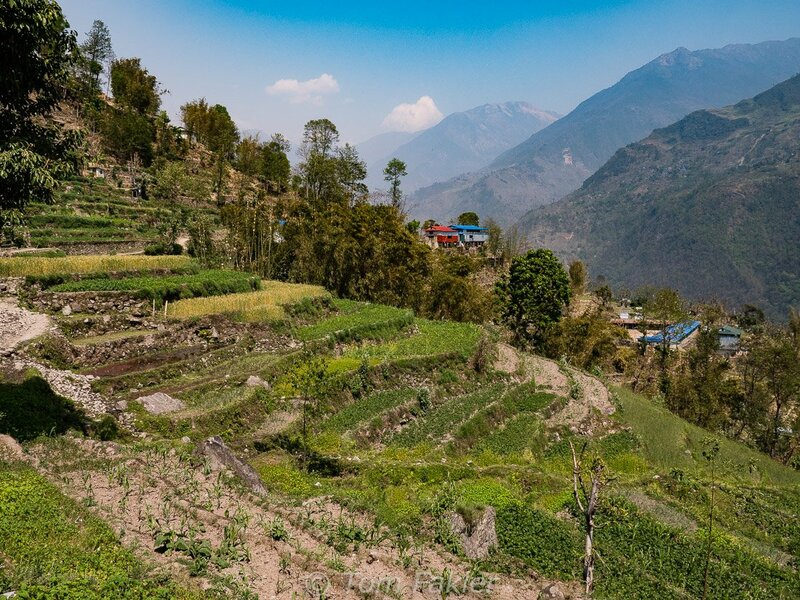 Travelers arriving in Nepal soon learn that the standard Nepalese meal, eaten twice daily by many Nepalis, is dal-bhat-tarkari, a “meal set” of boiled lentils, white rice, curried vegetables, and sour pickles. The lentils (dal) can be any of a variety of the legumes, the rice (bhat) is boiled, and the curry (tarkari) is generally vegetable and tomato-based. 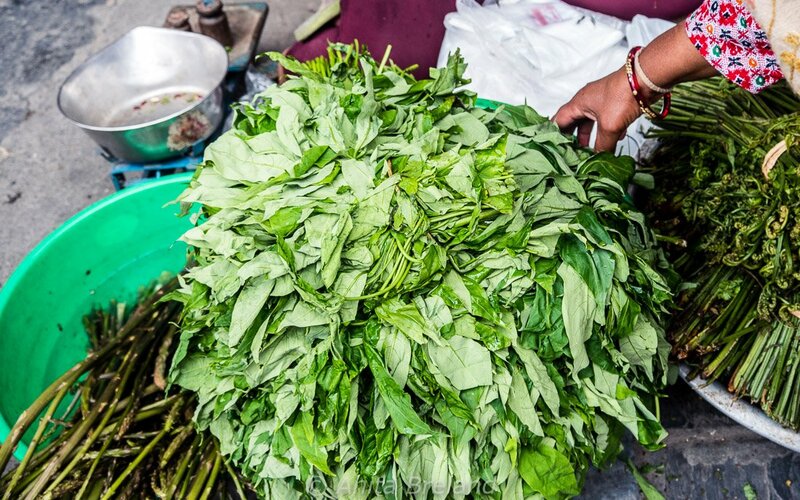 A dish of saag, the name given to any green and leafy vegetable here, adds a dash of bitter to the plate. Light spicing for the curries comes from a Nepalese masala that features cumin, coriander, ginger, garlic, fenugreek and the chives-like jimbu, and hotness from green chilies or perhaps the timur berry. The pickles (achaar) can be hot as well as sour and made from all manner of vegetables and herbs. Dairy is in the form of curd served in a little bowl alongside the other dishes of the set. Rice is the centerpiece around which the dal-baht-tarkari “menu set” is built. 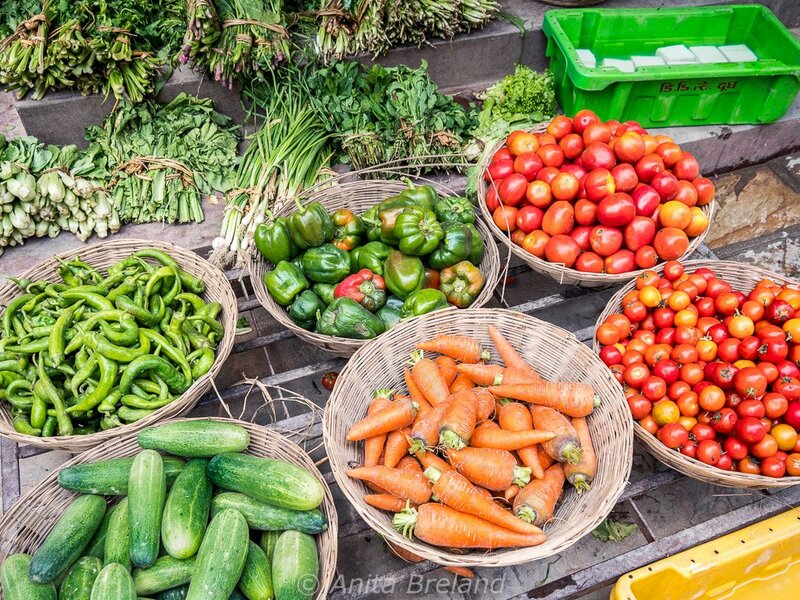 One thing many Nepalese dishes have in common: lots of fresh vegetables! The influence of Tibet has grown since the arrival of Tibetan refugees in the 1960s, and is substantial, especially in Nepal’s most mountainous regions. 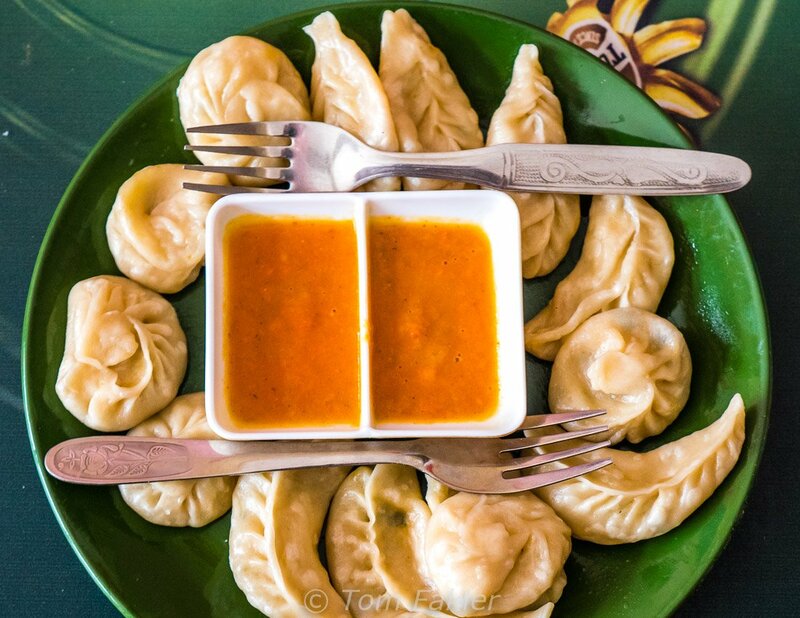 Momos—steamed dumplings with savory fillings—may be meat-filled (generally water buffalo or chicken), filled with finely chopped vegetables, or with a filling of grated yak cheese and a dash of “momo spice”. At one time a popular street food, momos are now served in restaurants all over the country and with a variety of sauces. Hearty noodle soups of seasonal vegetables in warming broth rely on simple ingredients available in the mountains. 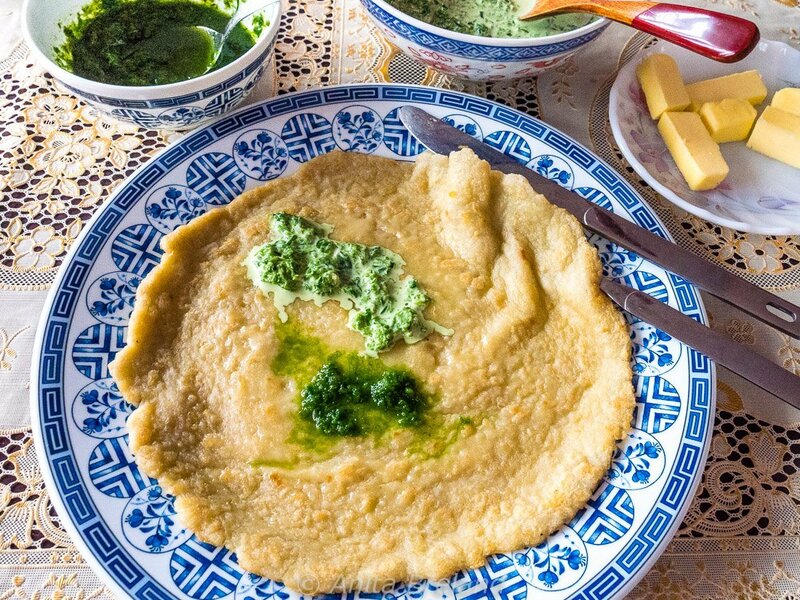 Sherpas prepare a hearty, distinctive potato pancake (Riki kur), guaranteed to fortify against the elements, and utterly delicious with a dollop of yak butter and green-chili sauce. The pancakes include grated potatoes and eggs and are griddle-cooked in ghee. Riki kur, Sherpa-style potato pancake. Best still hot, with spicy green sauce and yak butter. Thanks to Dawa Geljen Sherpa and his wife for inviting me and Tom into their Kathmandu home for momos and pancakes. Dawa is the founder and managing director of Adventure Thamserku and a trustee of Classrooms in the Clouds, a UK-based charity operating primarily in the Everest region, building classrooms and sponsoring teachers. Tom has supported these laudable efforts for several years, first visiting schools with Dawa in 2013. 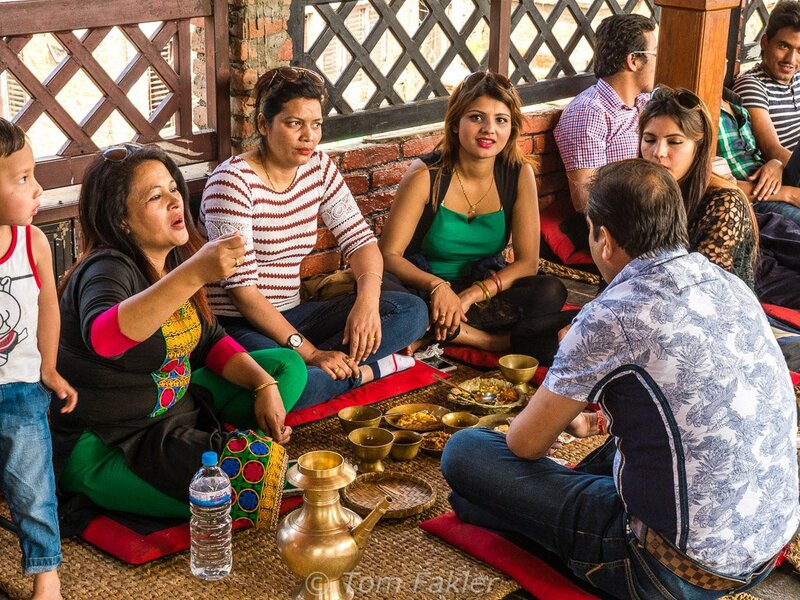 The Newari kitchen—a Kathmandu Valley original—is quite popular with locals. 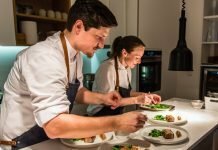 Food travelers should give it a try! Newars are known for their many festivals, and Newari dishes can be enjoyed as snacks or in combination as a full meal. 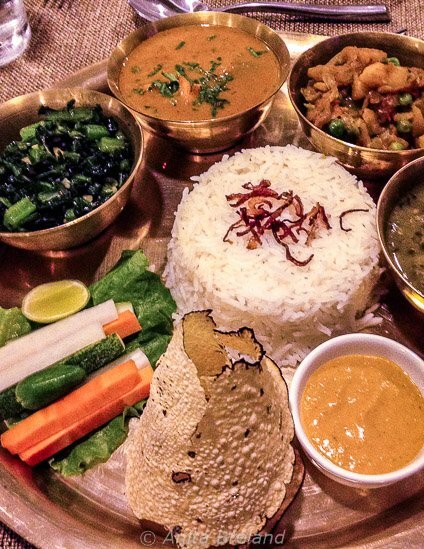 A Newari “meal set” offers a few surprises for anyone new to the cuisine: crunchy flattened rice and an array of sub-dishes hitting several taste receptors on a trip around the plate. Samay baji includes toasted soybeans, boiled black-eyed peas with tomatoes and onions, a hot and sour potato salad, bitter greens, fried garlic, slices of ginger and a portion of marinated, grilled buffalo meat. The Samay baji we sampled also included foods that are served as festival appetizers: a boiled egg rolled in turmeric and salt, dried sardines flavored with cumin seed and a lentil pancake (woh). Food is not the only gift of the Newars. 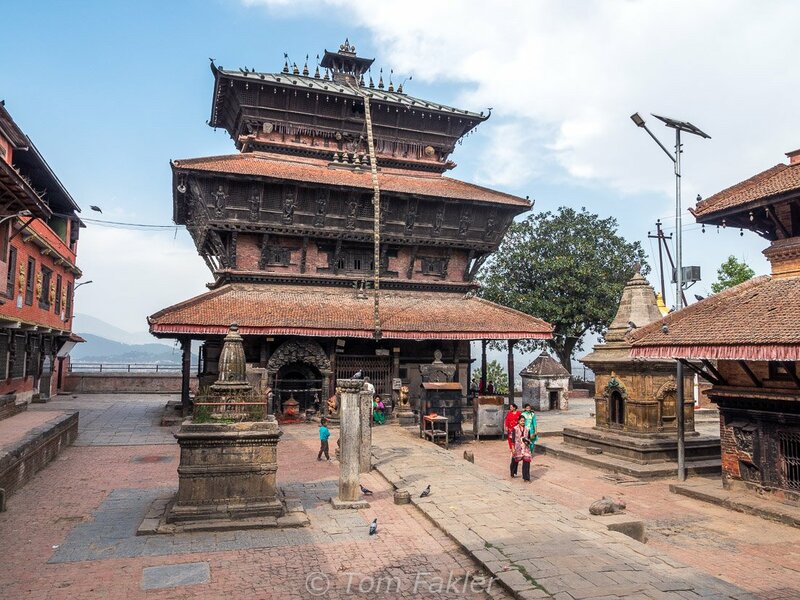 Centuries-old architectural gems such as Bagh Bhairab temple in Kirtipur have inspired modern structures across the country, as well. Tom and I had a super day tasting Newari foods and visiting Kirtipur and Patan with Rakesh Shahi, founder of Mystik Mountains Adventure & Holidays, Kathmandu-based cultural and adventure travel provider. We tried new flavors, sat on straw mats, met friendly locals and visited places in the Kathmandu Valley we would never have found on our own. My time on a personal yoga retreat in Pokhara offered a marvelous opportunity to experience an Ayurvedic kitchen, Nepali style. The ashram is in an orthodox Hindu home, where we ate twice daily, with our main meal as a variation on the traditional Nepali dal-bhat-tarkari. Evenings were lighter fare, usually a griddled flatbread with a simple vegetable curry and achaar, and perhaps a bit of saag left from the morning meal. I was impressed to see such creativity in a kitchen without refrigeration or an oven. Daily, we enjoyed new-to-me vegetable preparations on a base of healthful grains, such as millet and coarsely milled corn, as well as rice. Soups were enlivened with wild greens and just-picked herbs from the garden outside our windows. Freshly-ground spice mixtures were toasted to up their zip quotient. I’ve had ayurvedic dishes in an ashram setting in the past, but they were nothing like this! My two weeks in Pokhara were spent immersed in the ayurvedic lifestyle of Annapurna Yoga Ashram, a homestay with yoga master Narayan Prasad Dhakal and his wonderful, welcoming family. 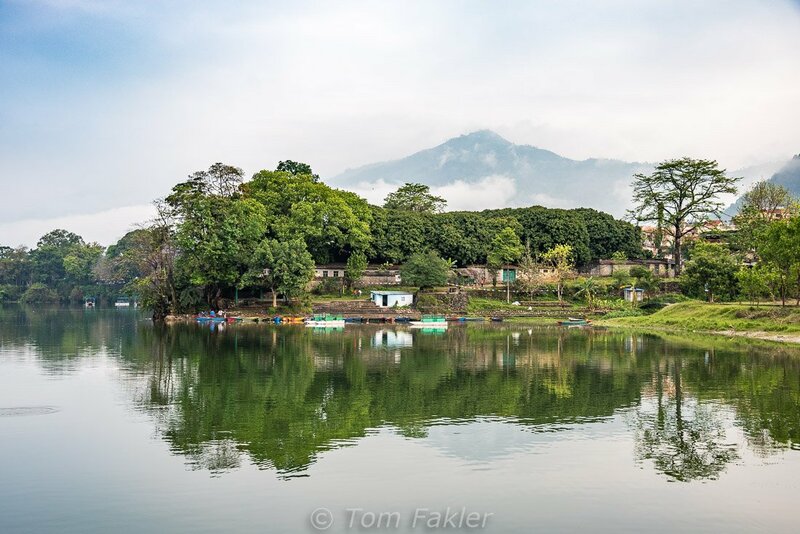 We shared morning and evening yoga and delicious vegetarian meals in the peaceful setting of Pokhara’s Lakeside district. During my month in Nepal, I was tickled to learn that the list of foods to be savored there is long, and the taste sensations of Nepalese cuisine more varied than this first-time visitor expected. Stay tuned for more from our travels in Nepal!